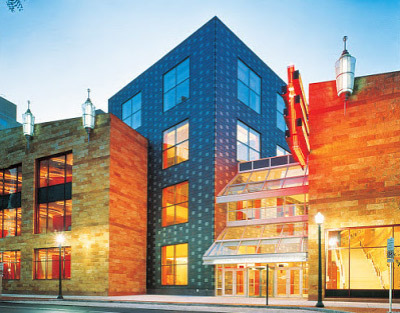 In addition to being home to a captivating blend of arts, science and entertainment activities, the Whitaker Center building is one of downtown Harrisburg’s most unique and exciting architectural treasures. Below are some interesting facts about the building itself. Architect Hugh Hardy's work includes restoration of Radio City Music Hall, the revitalization of Bryant Park, and renovation of the National Baseball Hall of Fame. 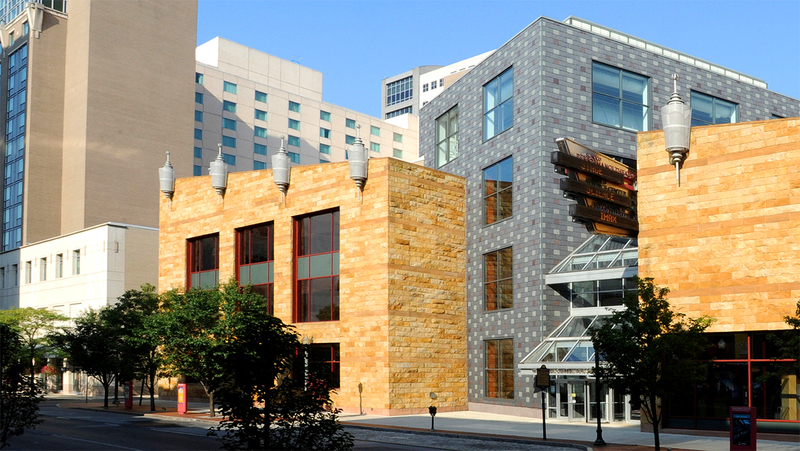 Consists of 6,455 pieces of golden sandstone, chosen by the architect to complement the gray Pennsylvania granite of many downtown buildings. The exterior is lit with 14 Pylon lights on the Market Street and Third Street sides. Each 15-foot electric Pylon contains 6-foot fluorescent lanterns that shine with 500 watts. Features a two-level connecting lobby for easy interaction between the three entries into the Center. These include Market Street (the civic front door where pedestrian traffic enters) a school group entrance on Third Street, and an internal bridge connecting the Hilton Harrisburg, Strawberry Square, and Walnut Street Garage on Arcade Level. A two story curved wall made of alternating bands of opaque and translucent materials can be illuminated for dramatic effect. Visual arts are displayed on this unique wall. A graphic design of gentle curves along the balcony of the Sunoco Performance Theater, coupled with flower shaped light fixtures was designed to honor the Susquehanna River in the springtime.